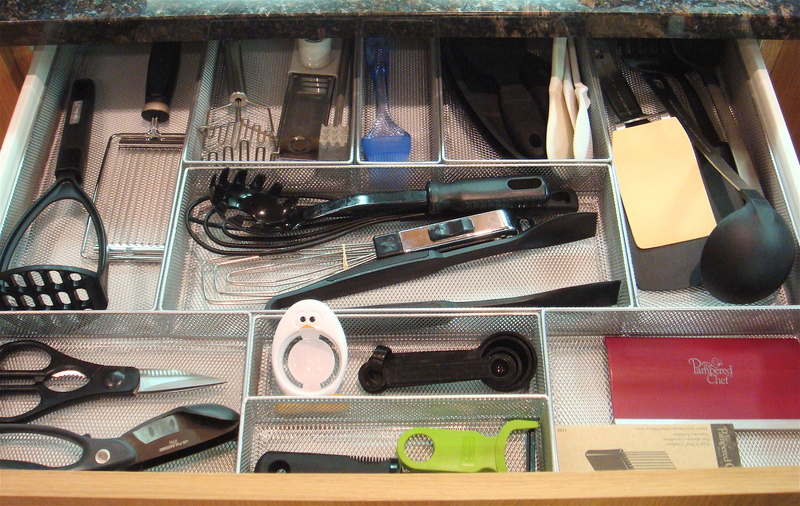 Pull everything out of the drawer sorting into prep and serving pieces, editing out anything you don’t use or need. Look at what’s left to see what size organizers you’ll need; extra long or wide. Using your drawer’s measurements, draw it out on paper to see how many organizers will fit. To make it look its best and not cluttered, create a symmetrical pattern. For the organizers in the back of the drawer, angle them from back to front for easy access. Group things by use to limit searching for things. If you have an inch or so left in the back of the drawer, wedge cardboard from a toilet paper or paper towel roll to make it nice and snug. I am all about organization and always looking for tips. Excited to find your blog! look forward to future posts! One and only one question.. from where do you get those drawer separaters.. ?? I am in dire need of them.. and of so many other things such as those wire racks and the canvas boxes..